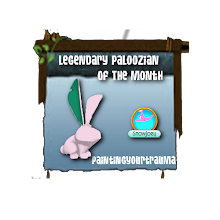 In honour of celebrating Animal Jam Legendary Palooza's 5th birthday! There is a giveaway and small contest which you can enter below. 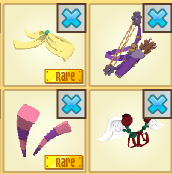 For the giveaway I will giving away these 4 items to one lucky person! Entries for the giveaway are due May 5, 2019! 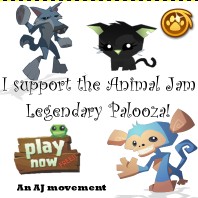 For this contest, you will be given 7 animal names, and will have to match a fact with the animal. The person with most facts correct wins!! 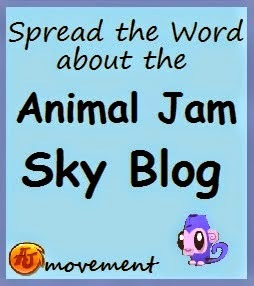 Here are the animals and the facts! Also there are letters beside the description so you can put the letter with the animal, instead of the whole description! Please do not copy anyone's answers or search up online! Entries are due by May 5, 2019. Ok I enter the moutain goat! It's a land animal of course! The goat will sit like dog but hunched a little, the goat will stick out its legs and then shuffling them. After that it will turn all the way around and start again! When playing it will jump left then look right to left and jump back to the same spot it was before! For sleeping it will lie down right with its legs under its body and it's head on the ground! For hopping it will jump a metre high with its legs tucked when it jumps! Yes it does come with a new land! It's the Land with the waterfall and rivers. ( the one next to mt shiver) the new land will be pefect for moutain goats and deer! The new land will have lots of overhanging trees, rocks and caves too! In a cave there will be a clothing shop with goat/ rocked themed items! In a overhanging tree there will be den items! Sorry! When it sticks out its legs and shuffles them and does that it's the dance I forgot to add that! Actions- Dance: Take arms and wave wildly around while kicking legs up in the air. Play: Wobble on long legs. Sit: Fold legs and sit on ground. Hop: Jump up and down. Sleep: Close eyes and fold body in slightly while raising one leg to it's knee (since they sleep standing up!). It would be pink as the color when you first buy it! No, it would not have a new land, but it's favorite place might be Crystal Sands! Coyote. The coyote would come with a new item and land. The land would be a desert and the item would be a bandanna. When they hop they jump up and down. When they sleep they curl up and close their eyes. When they Sit they stretch out on the ground. When they Dance They get up on their back paws, wave their front paws around and then do a flip. When they play they tilt their head and lift up their paws, like they are begging and dash away. They would look a bit like a Wolf but smaller and they would come as a dusty brown color. 1.) With the release of peacocks, a new sky land called "Cirrus Kingdoms" ("Cirrus" being a type of cloud). This land would be above Mt. Shiveer and would look like castles in clouds. In the giant castle would be a clothing and den shop, which would release items such as cloud couches. 2.) Also, there will be pet peacocks in the Diamond Shop worth 3 Diamonds. They will have big eyes and will come with accessories like tiaras, phoenix wings, and claws. 3.) With the release of these animals, there will be ANOTHER surprise. First a new land, then a new pet, and now a new... Party! It will be called "Flying Only Party". Which is a party just for flying animals (Eagles and Peacocks). The background will be a rain forrest scene up high in the trees, and it will be raining. It will have a music shop, a clothing shop, with wing and tail items, and a den shop, with floating items, such as a floating lamp. Anyway, peacocks will sit down like a hen on her eggs, they will dance by waving their stretched out tail feathers, they will sleep curled up in a little ball, and they will hop and swirl back down to the ground. 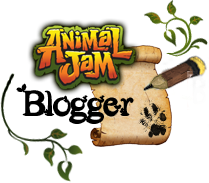 They will be a grrrrrrreat edition to the Animal Jam family! Landscape: This rain forest is filled with many different animals. Monkeys (both the jammers and others) can be seen in the trees. A poison dart frog can be seen in the corner, and toucans from above. Their is a game called rainforest race here where you must race through the forest and try to beat the other jammers. A small stream runs through the edge of the forest, and rain can be heard and seen. A new animal comes with the forest, a boa constrictor. 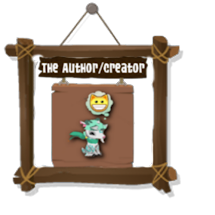 This animal must be earned instead of bought (you can get it in adventures if you get to a certain level). Toucans, Frogs, Gorillas, Parrots, Jaguars and lemurs would also arrive. Their are small caves, which are great for roleplaying in. One of the caves has a store inside with new and old items in it. Their are a lot of trees in this land though. And its a bigger land a bit larger then then the sky den. Here's my entry for your contest! Banyan Tree: The single tree that grows in the land. It's ginormous roots create a handful of islands. I can't figure out the bonus ones xD I'll try later! Good luck everyone! 3: Its some type of fish right? Story: Liza was hungry so she ate Sir Gilbert's pet monkey, Sir Gilbert Then ate Liza's pet hamster. Then it became a who-Can-Eat-The-Most Contest and soon they ate all of Jamaa. Story: Once upon a time, there was a big, flat, empty land. A blue heron named Mira flew by and wanted to change it into something beautiful so others could enjoy. So she got her best friend Zios, and together, they changed the land. It was now full of color and life. 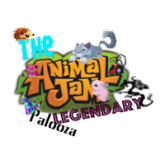 Animals trickled into the land, now called Jamaa and soon there were tons of animals. To this day, they celebrate Mira and Zios, for creating this wonderful land. Story: In a faraway land, there lived a blue heron. She lived on her own, and was always thinking of ways to make the world a better place. One day, as she looked out across the mountaintops, she imagined a beautiful new land, with lots of plants, animals, and fun. Every time she thought about the land, the more confident she became that it could one day become real. She knew that she was just ONE animal, one animal who couldn't make an entire land by herself, but at the same time, she felt it was possible. Several months later, she was dreaming when a flash of white light appeared. It finally faded, revealing a big, beautiful village, just like how the heron had imagined it. A voice told her that she was destined to be the creator of this land, a land where all animals lived in harmony. The voice-spirit graced her with the name 'Mira'. Once Mira awoke, she immediately took off towards the mountains. She flew for days and days, never stopping, knowing somehow exactly where she was headed. Finally, she reached a flat, green field, and received a vision of the land. She immediately starting creating, and after a few days, a spirit called Zios came down to help her. But soon, Mira realized that other creatures wanted the land. Black, alien-like creature with one eye, called phantoms. Mira and Zios tried to reason with the phantoms, but they attacked. When Zios jumped in front of Mira to save her from being hit with a lightning blast, he was hit himself. Zios was gone forever. Despite her sadness, Mira managed to finish the last continent of her land. She named it 'The Lost Temple Of Zios', and put a memorial of Zios in the center of it. She then flew around the world with untiring energy, inviting all animals to come live in her new land. Soon, Mira's village was bustling with pandas, monkeys, tigers, wolves, koalas, and bunnies. And when the sun set over the hills, on the first day of Mira's land, she named it...Jamaa. Mira circled over Jamaa. The once lovely city was ruined. The phantoms had struck with no warning and had captured the city of Jamaa. All they left was destruction and pollution. The rivers and seas flowed with pollution, the plants had all withered and died, and many animals were sick and dying. Animals were captured, never to be seen again and entire species were being driven out. All of this was her fault. She had created these phantoms! Life had been perfect, life had been so sweet. Zios and her had created Jamaa, a happy and safe place for animals of all kinds. However, life soon took a dark turn. Zios began pulling away he no longer spent as much time with her, he was always busy. Soon she found out why. He had fallen in love with a swan who lived in jamaa. She felt so betrayed, so angry! Her jealousy, her bitterness, her anger came together and created the first Phantoms. She had called them her children, and cared and protected them. She thought they were good that they were a blessing. She never guessed how wrong she was. When Zios discovered them he tried to destroy them, he knew they had the power to destroy jamaa. However, more and more phantoms began appearing, and he sacrificed himself to destroy them. Her anger had turned to grief when she realized what had happened. Her creations were evil, they had killed her husband. New phantoms were born from her tears and the darkness of jamaa. No one had known they were there till it was too late. Now Jamaa was falling apart around her. The remaining animals rushed over to see her. "Mira your back" Greely, a blue wolf yipped. "We were worried" Sir gilbert, a tiger, added. Liza, a panda, nodded "We were worried something had happened to you" she said. Cosmo,a brown koala, nodded in agreement. She sighed "Don't worry about me, focus on the war. We must find someway to drive these awful phantoms away from Jamaa." she said. They nodded, "Yes Mira" they said. She frowned glancing around, a battle with the phantoms was a suicide mission. The phantoms outnumbered them and the animals were weak already. However, what other choice did they have? It was fight or die, there was no other way unless... She paused glancing at her friends an idea forming in her head. What if she granted these four faithful animals power? It could work... "Greely, Sir Gilbert, Cosmo, Liza... you must listen to me. I have a plan to drive away these phantoms once and for all but it's dangerous. I will give you four powers which will allow you to drive these phantoms away and protect your fellow animals. Then Jamaa will be safe again" she said. They looked stunned. "Us?" Cosmo asked "You choose us out of all animals?" She nodded "Yes Cosmo i choose you four. You are the animals i trust the most, i know you will return Jamaa to what it was before the war!" she said. "I accept your offer Mira. I will fight to the end" Greely said. "I will also fight! These phantoms will wish they never were born after i'm through with them" Sir Gilbert said. Liza nodded "You can count me in!" she said. "If.. if you really want me to i will fight" Cosmo said, his voice nervous. She smiled, and they began to glow. She filled them with power, giving them some of her own abilities. The glow faded and they were ready to face the phantoms. "You are no longer ordinary animals. From now on you are the Alphas, the protectors of Jamaa!" she shouted.They dipped their head to her then began moving toward Jamaa Township to face the phantoms. After hours of fighting they returned, victorious. "What now?" Cosmo asked Mira "Should we start replanting the plants and get rid of this pollution?" Mira sighed "Cosmo, Sir Gilbert, Liza and Greely. It is time you make these decisions for yourself. I can't help you anymore, you must help yourselfs. You are the Alphas, i am just an old weak bird. I am leaving Jamaa, i can not stay here any longer. You are the protectors of jamaa now" she spoke sadly but firmly. "Mira you can't! Mira you must stay! Don't leave us! Mira! MIRA!" the animals cried out. She ignored them and flew into the sky. She dove down into the flames of the fire and vanished into thin air. After that the only animals who ever saw or spoke to her were the new alphas she had chosen. However, her spirit can still be seen in the fire where the animals saw her leave. Ooo! Ooo ooo ooo! I'm so doing this! Can I post the finished product on my blog? It's not a very good 'party' look but I didn't have a party hat or anything, except for the spring one but ehh lostfairy (which seems to be my only competitor) is already using one. As for the animal, they should add a cow! Sit just an average horse sit! - Play A bell appears on its neck and it rings it? - Sleep kind of a lynx sleep? - Hop Just the average hop! Ackkkk, sorry, Vi! I don't have the time to draw an animal and pet. Or guess all of those people. DX Sorry! !